The Indoor Football Championship goes through Sioux Falls at the Storm Shelter (the Denny Sanford PREMIER CENTER) as the Sioux Falls Storm host the Arizona Rattlers in United Bowl 2017 at 5:05 pm Central Time is a highly competitive matchup. 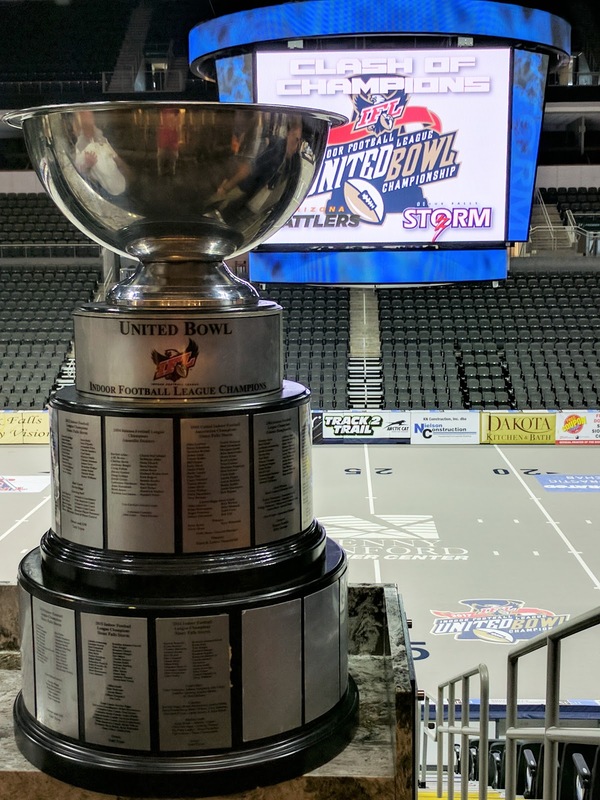 The storied United Bowl trophy cup will be defended by the 6-time IFL championship Storm in United Bowl 2017 at home against a crack Arizona Rattlers team, named IFL Franchise of the Year. The 2017 United Bowl Media Day press conference gave press and fans alike a chance to query coaches and players participating in what is proving to be possibly the most anticipated Indoor Football Championship, ever. 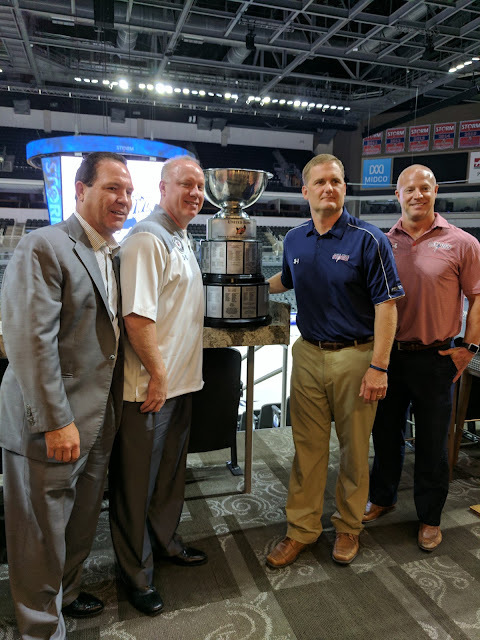 Arizona Rattlers Owner Ron Shurts and Head Coach Kevin Guy accompany Sioux Falls Storm Head Coach Kurtiss Riggs and Owner Todd Tryon (left to right) portrayed here with the prized IFL Championship United Cup trophy. The Arizona Rattlers (13-4), who have previously dominated AFL football, in their inaugural year as an IFL member team, have finished strong with a spectacular 2017 season holding the Intense Conference title cup trophy and were even named as the IFL Franchise of the Year. The Sioux Falls Storm (15-2) are the United Conference Champions and the six-time (consecutive years since 2011) defending IFL Champions. 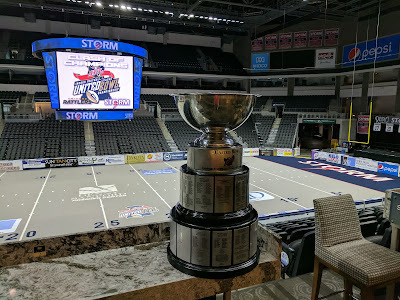 The Storm also had another banner year in contributing to their community and have now raised over $400,000.00 in charitable donations over the last 3 years. I was able to record most of the event on 4k Hi-Def video today, and the following 4 videos document the press conference. I hope that I am getting the videos in sequential order as they occurred in the linear timeline of the media event. -United Bowl 2017 Media Day video 1 of 4. -United Bowl 2017 Media Day video 2 of 4. 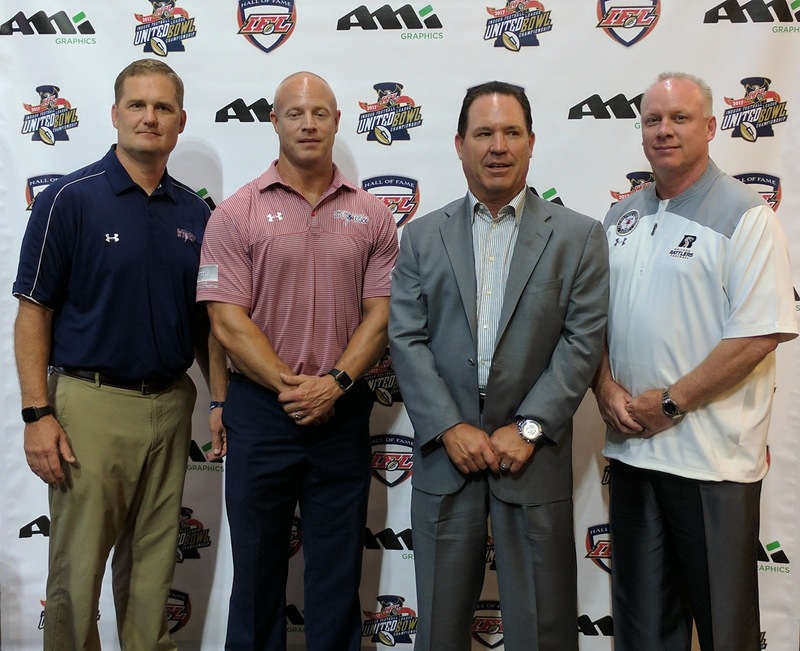 -United Bowl 2017 Media Day video 3 of 4. -United Bowl 2017 Media Day video 4 of 4. For years, the Storm has dominated the IFL and the fans of opponent teams have often told us to go to the AFL if we think we are so good. But recently, teams from the NFL's Arena Football League have arrived in the IFL (Iowa Barnstormers & Spokane Empire, aka Shock, arrived in 2016) and most notably the 2017 "rookie" Arizona Rattlers are the Intense Conference Champs, and the IFL Franchise of the Year). It will take a lot to win that United Bowl trophy and become the IFL Champs for 2017, but now the Storm finally has some competition in what may prove to be their most dangerous foe on the field, yet. 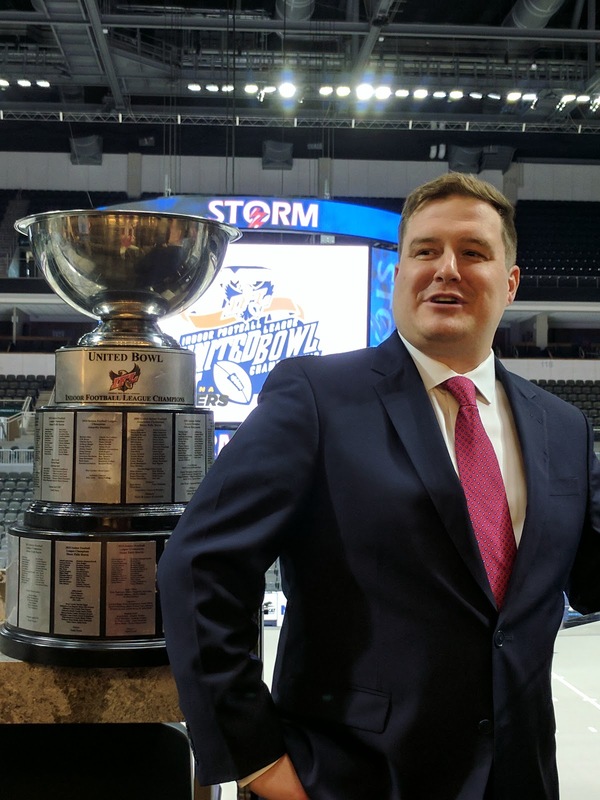 Luckily, Head Coach Kurtiss Riggs and Owner Todd Tryon have the home field advantage in what we anticipate to be the loudest Sioux Falls Storm game, ever... and we are expecting a sell-out crowd. My prediction? This will be an exciting game! But, Storm Nation will rise to the challenge. Rattlers Owner Ron Shurts & Head Coach Kevin Guy. The last time these two teams met was at the 2017 Sioux Falls Storm home opener and the Rattlers were leading at the half. Thanks to the Storm Thunder Defense, the Rattlers had trouble scoring as much as our Lightning Strike Offense lead by QB Lorenzo Brown (GIF from action taking place on February 17th).